How is it that a professional paint job in the SF Bay Area costs upward of $4500?? Is that normal or just because we live in this insane >$1000psf place? At that price, I could wrap the car ten times over. But thankfully I’m only doing it once, cos it’s helluva tedious. The prep work for wrapping is probably ~60% of that for painting. You still have to fill all dings, prime and sand to 400-600grit, as anything deeper will show through the vinyl. 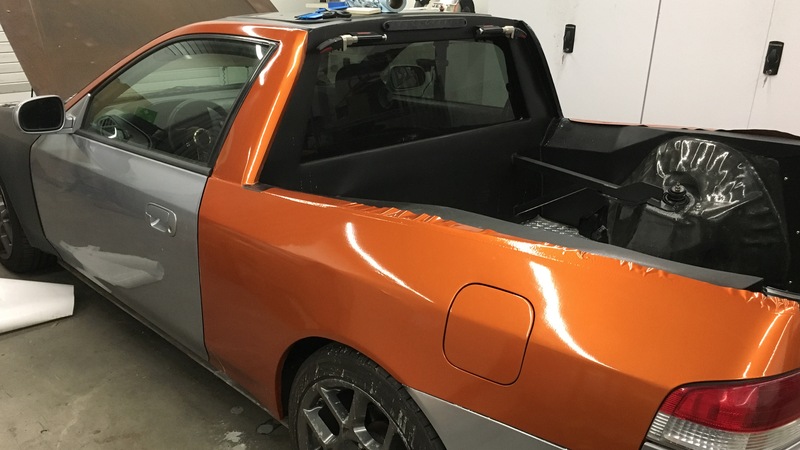 This is the only part of the project where I sought professional help and had my trusted bodyshop fill and sand the top and insides of the bed. Saved me a lot of time, but I still had to do all the minor dings and final blocking on my own just before wrap. I also opted to go two-tone and paint the tricky to wrap areas in semi gloss black - fuel filler cap area, license plate cavity, mirrors, grilles etc. Had to do that before wrapping so that I could define the boundaries by trimming the vinyl. With the help of my friend/coworker, I decided to tackle the rear fender first. This was the first time I’d ever wrapped anything bigger than a strip of chrome trim, and we figured this was a reasonably easy panel with a single crease. Which it should have been. But being the total noobs we were, on our first attempt we peeled it progressively and laid it down starting from the left, ending up with really bad creases by the time we got to the right. We realized it was better to peel off the entire sheet and tack it down along the crease first, then squeegee up and down from there with judicious use of the heat gun. Once we had that epiphany, the rest of the steel body panels were relatively easy. Not having a garage sucked pretty bad for on-car wrapping. This was me wrapping the passenger side door in my open carport at 10pm on a chilly spring night. Notice the door mirror had been painted black at this point, as were the internal surfaces of the door. Door handles had to be removed for wrapping too, and I used the opportunity to fix my loose door handle by strategically placing a screw to act as a spring stop. The fenders had to be removed to wrap the doors anyway, so my wife and I wrapped them in our living room after the kids had gone to bed. Oh yeah, she’s definitely a keeper. The hood was properly rusted so I had to take it down to bare metal and prime+sand it before wrapping, to the chagrin of people in the laundry room from where I was tapping my power. Since it had some undulations in it, I opted to wrap it in faux carbon fiber, instead of orange gloss which would have made the bumps too obvious. Once again, my lady awesome was right there wrapping with me. I didn’t have her around every time I wrapped though, so eventually I macgyvered this head-mounted hands-free hair dryer solution. Should probably patent it at some point. I was trying my darnedest to finish it all before a two-week work trip, but fell short and couldn’t get to the bumpers and skirts. Still, it didn’t stop me from taking her to the local monthly old school JDM meet and rubbing shoulders with true classics.